Amazon unveiled its own plans to compete in the user-generated video market with the launch of a new service called Amazon Video Direct in a surprise announcement this morning. This service, explains the company, allows creators to upload their own videos to Amazon’s Prime Video and generate royalties based on the hours streamed. Creators have several options to monetize their videos, including making them available to rent or own, or they can make them free and ad-supported. The videos can also be packaged together and offered as an add-on subscription to Amazon Prime Video. Add-on subscriptions are available through the Streaming Partners Program, and are intended for larger-scale video providers. The new program will likely appeal to creators given Amazon’s scale. This self-serve platform reaches the company’s “tens of millions” of Prime members, Amazon notes. Many of these customers are already engaged with Amazon Prime Video, as they use this Netflix-like service to watch Amazon’s free TV shows and movies, including both popular network TV and Hollywood films, as well as Amazon’s own original content. In addition, Amazon says that creators will have control over where their videos can be streamed. For now, that means they can be streamed in countries where Amazon Video is available – the U.S., Germany, Austria, United Kingdom and Japan. 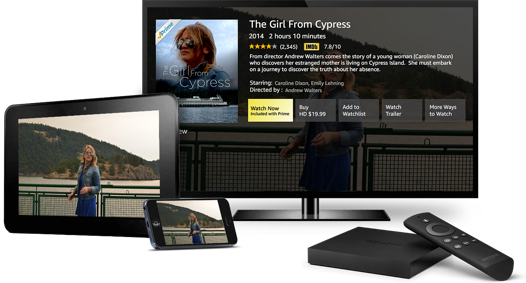 These videos can be played back anywhere Amazon Video works, as well, which includes mobile phones and tablets (Fire, iOS and Android), desktop, game consoles, connected TV platforms, and Fire TV. Like other video sites, creators will also have access to metrics to see how their videos are performing. This system, at launch, includes the ability to track number of minutes a title was streamed, projected revenue, payment history, and number of subscribers. This allows the creators to make changes based on their metrics, says Amazon. According to Variety, Amazon will pay partners 50 percent of the retail price for digital purchases, rentals and subscription fees. If creators distribute on Prime Video, they will earn royalties of 15 cents per hour streamed in the U.S. and 6 cents in other territories, their report indicates. (This is capped at $75,000 per year). Along with the debut of AVD, as the new service is called for short, Amazon is also launching AVD Stars. A unique promotion designed to kick-start this new video platform, the AVD Stars program gives creators a share of $1 million per month based on customer engagement with their title. Amazon says it will distribute a monthly bonus to creators from the $1 million monthly fund, based on the Top 100 AVD titles in Prime Video. This is on top of any other revenue earned. All creators and providers who use AVD will automatically be enrolled. The program launches today and the $1 million monthly fund will make its first bonus distributions based on streaming activity from June 1st to June 30th. Amazon’s announcement noted some of the early names it has signed up to participate in the new program, including Conde Nast Entertainment, HowStuffWorks, Samuel Goldwyn Films, The Guardian, Mashable, Mattel, StyleHaul, Kin Community, Jash, Business Insider, Machinima, TYT Network, Baby Einstein, CJ Entertainment America, Xive TV, Synergetic Distribution, Kino Nation, Journeyman Pictures, and Pro Guitar Lessons. As you can tell by the selection, Amazon is targeting larger video creators and MCNs (multi-channel networks), as opposed to the everyday, mainstream users who use YouTube to upload personal videos. That makes the service competitive with something like Vimeo, as well, especially given the options to rent or sell videos. The launch follows Amazon’s recent debut of standalone subscriptions,which target non-Prime members at a cost of $8.99 per month.